Comparing with the solid hardware which helps consumers capture high quality videos and photos in rough conditions, the known “SD card error” on GoPro Hero seems to be its only soft spot, though the company is not to blame for this problem. SD card, as a super convenient storage media, can be used in various electronic devices, but the tiny drive faces many more threats than other built-in parts of a device do, such as dust, water, shock, software issue, etc. As a result, it is common to see No SD or SD ERR on GoPro Hero6/5/3 Black & Silver camera. 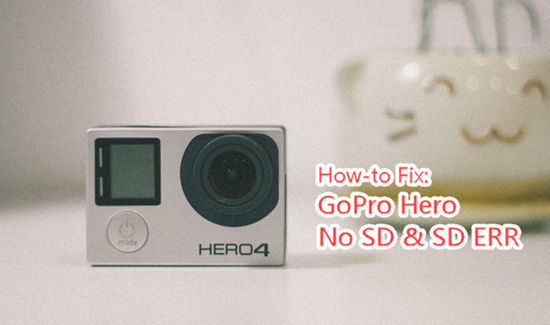 We hope this tutorial will help you find a solution of GoPro SD error recovery. These are error messages when your GoPro has problem in communicating with the SD card even if you have inserted the card into the camera. The error could happen on all versions of GoPro products and SD memory cards, especially those with faulty quality or poor compatibility. Following are what you should do once the error occurs. All cameras need be a minimum of Class 10. The HERO camera only supports up to a 32GB card. HERO3 Black Edition, HERO3+, HERO+ and HERO+ LCD cameras support up to 64GB. HERO4 and HERO Session cameras support up to 128GB. Anyway, you may still try following tips to get a GoPro No SD fix. Remove and reinsert SD card to make sure it is correctly inserted. Power off and restart GoPro camera to exclude temporary glitch. Clean the SD card metal pieces with a toothbrush or rubber very gently. If you think the card slot within the GoPro is dirty, also clean it carefully. Don’t insert the card into the camera until they are both dry. If the tricks above don’t work, you may have to format the SD card properly which may remove potential issues that cause the problem. This should also work if the “SD ERR” problem occur after you have used the SD card in another camera. This would wipe all the files on your card, so please move the files to a computer first. If you fail to find any file on the card when connected to a PC, check this tutorial to find hidden or deleted files on GoPro. We can format GoPro SD card within the camera: just enter the Settings menu and select the trash can icon to Delete All/Format your SD card. If you see “No SD” on GoPro camera LCD, it is also very easy to format SD card by connecting to a computer. GoPro SD error may also appear when you use a newer SD card on an older GoPro version, which could be fixed with a firmware update. To do that, you will need to connect your GoPro to a computer or use a blank SD card, depending on the GoPro model that you own. The exact steps also vary based on the device you own. Please refer to GoPro’s official update guides. It is not necessary that the above 3 solutions can fix GoPro SD card error for you due to unpredictable accidents and conditions. Nevertheless, it is important for all users to keep existing files and recover lost photos and videos from GoPro SD card first. And then, we can narrow down where the issue is coming from step by step. Please share your experience here so that people can benefit from the discussion.